I won’t give them all away here, but Joel Shannon of the York Daily Record has put together a list of 7 things you’ll see at an Amish mud sale. 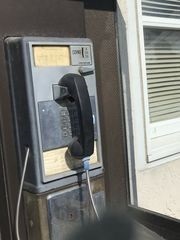 They include “Hot dog lines” (50-cent hot dogs still exist), “Cliques”, and “Phone booths”. Shannon recently attended the Gordonville sale. See the rest here. Today Amish schools are ubiquitous, as is the system of schooling which sees Amish children finishing their formal education at age 14 or 15. Half a century ago, however, Amish parents struggled for the right to educate their children in the way they felt best. You might recall the infamous photo of Amish children fleeing into cornfields to avoid forced busing to a town school in Buchanan County, Iowa. Eventually the 1972 Wisconsin v. Yoder decision ensconced the ability of Amish to limit their children’s schooling to eight grades. Three Old Order Amish couples from Mount Eaton had been charged with contempt of court for refusing to place their teen sons in the Wayne County Children’s Home. The boys — Sammy Hershberger, 14, Andy Hershberger, 15, and Jacob Slabaugh, 14 — were considered truants because they weren’t going to high school. Ohio law required children to attend school until age 16, but formal education in Amish households ended at eighth grade. Something had to give. Eventually public backlash became so great that they were released after about two weeks. They were no longer prosecuted, though the matter was not formally resolved until the 1972 Supreme Court decision. If it were God’s will, the families would stay in jail, Swartzentruber said, but they wouldn’t give up their children. “We’ll have to suffer the consequences for Christ’s sake,” he said. 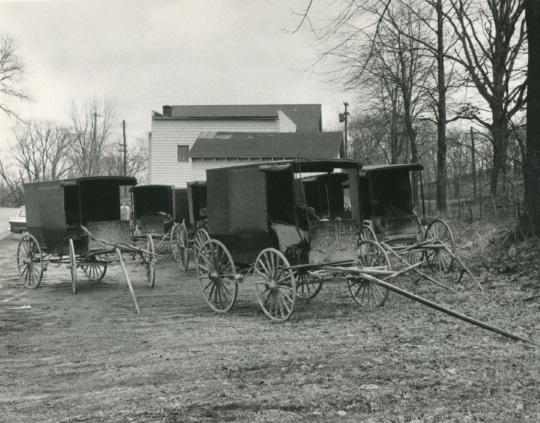 Buggies parked near the Wayne County Courthouse during the Amish parents’ appearance in court. March 12, 1958. Beacon Journal/Ohio.com file photo. Given the ages of the parents at the time (mid-40s), it is highly unlikely that they are still alive to recount what happened, but their teenage sons might very well be. That would be an interesting story to hear. This is an odd incident which occurred last week in Lancaster County. Someone driving a decommissioned police car pulled over an Amish buggy and asked the driver about alcohol and drugs. Though the man was initially reported to be in his 20s, it turns out these were two youth playing what appears to be a prank. Of course you can’t pretend to be a police officer. Though as we’ve seen, police sometimes have to pretend to be someone they’re not – sometimes the last person you’d expect – to catch the bad guys. 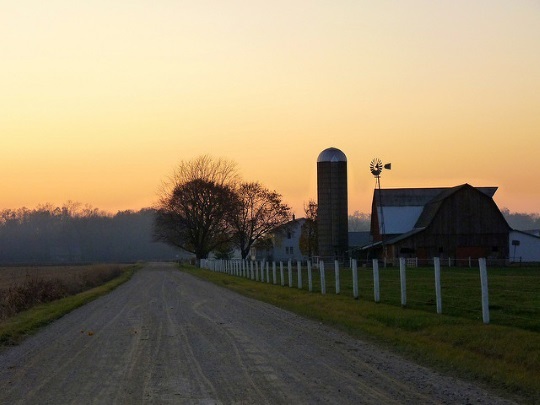 We recently reviewed the various ongoing issues with road damage in Amish-inhabited areas around the nation. A new report looks at how Indiana counties are addressing the problem caused by Amish buggy horseshoes. Elkhart County is one of the only localities which requires license plates on buggies. Plate fees are dedicated to road repair. But it seems the $55 annual fee is not enough to cover the damage, so the county is eyeing an increase. Finally, here are three photos that caught my eye recently on Flickr. Amish youth hunters. Wayne County, Ohio. Photo by Andrew J. Cerniglia. Farm at dusk, near Middlebury, Indiana. Photo by yooperann. 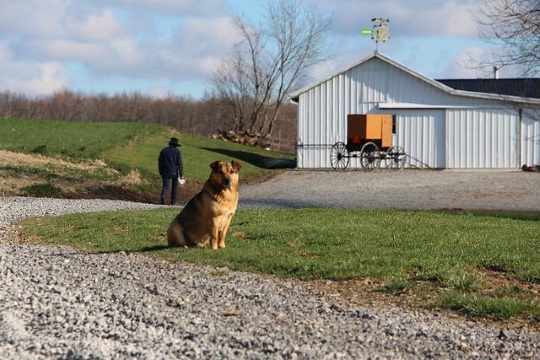 Amish people may be reluctant pose for photos, but their dogs don’t seem to have a problem with it. New Wilmington, Pennsylvania. Photo by WCN 24/7.